Download the Century Theaters job application on this page. 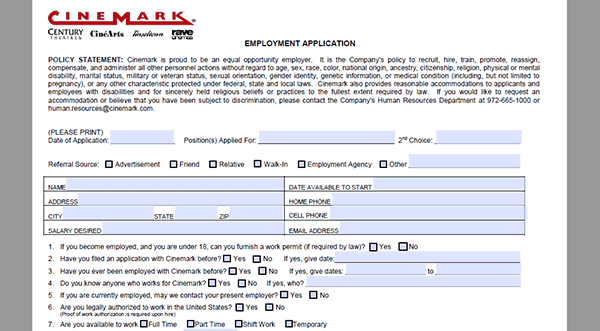 The application can alternatively be filled out and submitted online by going to the Cinemark careers page (more details in the section below). Both corporate and theater positions can be applied for on the careers page/site. About the Company: Century Theaters is owned/operated by Cinemark. It is a chain of movie theaters with more than 490 locations throughout the United States (with numerous international locations). The company is based out of Plano, Texas and was founded in 1984. Step 2 – Once on the careers page click the “Apply Online Now” link (outlined in red below). Step 3 – Search current job openings by selecting a career category, state/province/region, city, or keyword/job number. Click the “Apply” link to go to the next step. Step 4 – Review the job summary, responsibilities, and requirements. Click the link as outlined below to go to the next section. Step 5 – Press the “Start Here” button to create a new account. Step 1 – Use the link at the top of this page to download the application in .PDF format.